1. To make the gnudi, put the ricotta in a sieve and place over a bowl. Put in the fridge and leave the liquid to drain for a couple of hours. 2. Put the drained ricotta in a bowl and stir in the parmesan, nutmeg, lemon zest and a pinch of salt, until well combined. Spread ½ the semolina over a tray or large plate. Dust your hands with a little of the remaining semolina and roll the ricotta mix into 20 equal-sized balls. Place each ball on the semolina and roll gently until covered, then reshape if needed. Sprinkle ½ the remaining semolina in the tray; arrange the balls on top in one layer, close together but not touching. Cover with the last of the semolina. Put in the fridge for at least 12 hours. 3. When ready to serve, cook the peas in simmering water for 2 minutes, then drain and run under cold water; set aside. Melt the butter in the pan until it froths. Take off the heat and stir in the garlic and chilli, then the lemon juice, peas and mint. Season and keep warm. 4. Carefully remove the gnudi from the semolina, shaking lightly to remove any excess. They are easily overcooked so make sure you have everything ready first. Gently drop the gnudi into a large pan of boiling water. Cook, skimming any excess semolina from the surface, until they rise to the surface (about 2-3 minutes). Quickly lift out with a slotted spoon, drain well and divide between bowls. 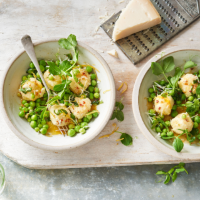 Spoon the warm pea butter over the top, scatter with the lemon zest and drape over a few pea shoots. Grate over a little extra cheese and serve immediately.